Welcome to my first Painting With Watercolors (watercolours) newsletter. It is intended as a summary of what has gone on with regards to my Painting With Watercolor site in between newsletter releases. Primarily this will include new demonstrations and articles. I hope to include some other interesting and useful information regarding watercolor painting which won’t have yet been posted on the website. I often hear people say that watercolor painting is really difficult or that it takes years to learn. Even so I find some students can get very upset with themselves when they do not quickly start producing good work. They look at other peoples’ work and wonder why theirs hasn’t gone so well. So what is right in all of this? Well firstly while watercolor is more difficult to learn than some other painting mediums it does not necessarily mean it will take years to learn how to paint good paintings. What is certainly true is that we all come to this medium with different life experiences, in my case I had studied engineering which had developed my observation skills and helped me get a better feel for what the water was doing on the paper (this happens to be critical), others have had experience in other mediums so their understanding of colors may be more advanced, while others bring a love of design or anything creative which can help with the more spontaneous sections of a watercolor painting. However apart from our previous experiences there are some things we can all bring to our early watercolor work. The first is a desire to learn and more importantly to have fun with our watercolor painting. Having fun is very important I feel, especially if you are taking on this subject in your later years as a pastime for some of your spare time. You should never lose sight of your desire to have fun with this medium. Take a moment as you paint to marvel at the beauty of the watercolors flowing and mixing on your watercolor paper. In addition to having fun and a desire to learn. The right attitude should be a belief that with practice you will succeed, sure there will always be something you can improve, but you should always acknowledge what has worked with your painting first before looking at what hasn’t worked. In time you will find more and more passages have worked and less haven’t. Look at the areas which haven’t worked with curiosity rather than disappointment. Look at what has happened and how the effect could have come about e.g. letting the paper dry too much before going back in with a very wet brush, too much water in your mix, not enough water in a mix, painting too slow, etc. By analyzing your work this way you can improve it in future paintings. Sometimes when we are having difficulty with an area and can’t solve it then that is when we should go and ask other artists if they can advise on a solution or a reference, or we can look into the watercolor books in our library (I have about 150) or these days we can do a Google search of the internet and will most probably find something there to help out. When I first started with watercolor I loved the challenge it presented and treated everything that didn’t work with curiosity and interest. This attitude helped my work to progress. So for those of you that sometimes get upset with your work, I hope the above is of some use. Keep painting with curiosity, observation, and the conviction that you will succeed and you will certainly produce some nice watercolor paintings. Have fun painting! 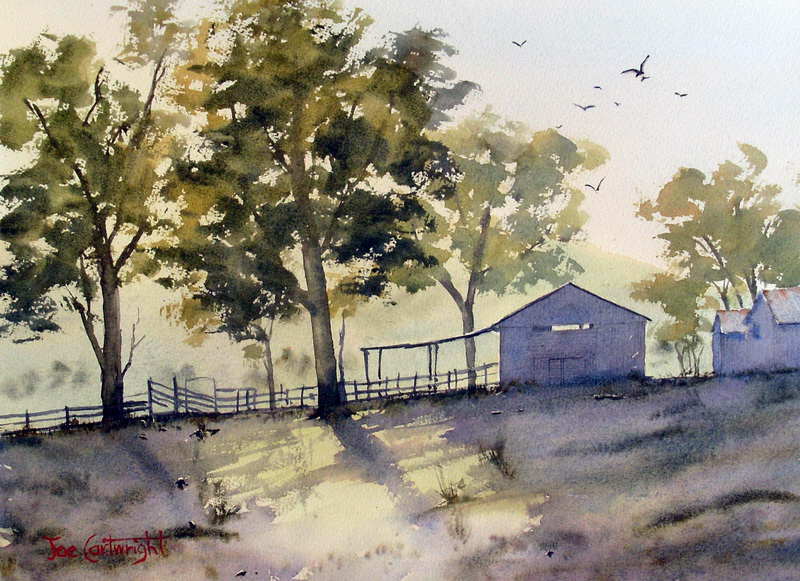 In May I posted a new watercolor demonstration. It is titled “Beach Sunset” and is a good painting to teach you about wet on wet passages, splattering watercolors, and how to paint an atmospheric beach scene. You can see it on my website or by clicking on this link here: Painting an atmospheric beach sunset scene. Have a go at it if you like and please do not hesitate to contact me if you have any questions. I put together an article along with a short video on one way to flatten your watercolor paintings after they have been completed. This is one technique I have found very useful and you may too. Removing wrinkles in your watercolor paper. I also posted an article on the importance of water and time when painting with watercolors. People often concentrate on colors and color mixing while the most important ingredients are actually water and time. 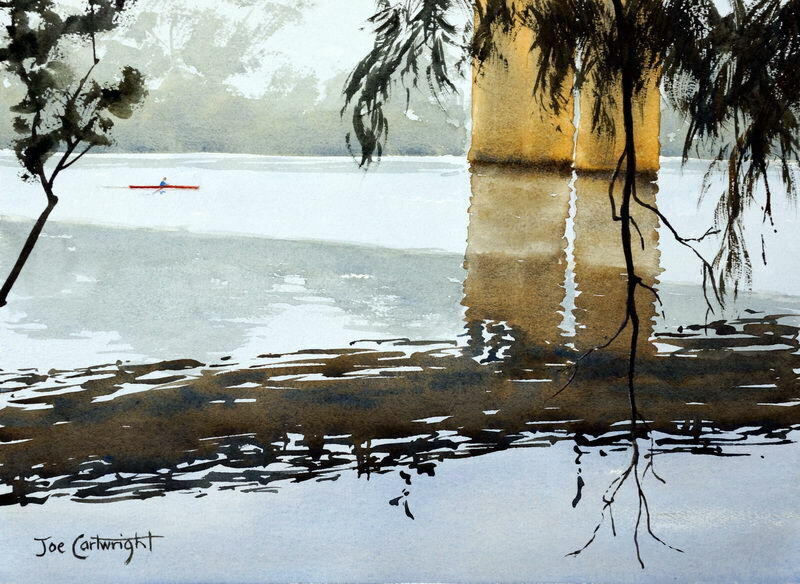 It is water that allows us to produce some of watercolor painting’s most beautiful effects. Time is also very important as often we have to wait for just the right moment (when the paper has had a chance to dry just enough) to create certain watercolor marks. I am in a process of producing a series of video demonstrations which I will sell as DVDs or as downloads at an affordable price. They will be very much in the same style that I run my workshops and regular lessons only you will be able to review them at will. The focus on the DVDs will be very much based on education, teaching you useful techniques as I paint through a full watercolor or pen and ink painting. I will provide more updates at things progress. This is the next painting which will go up on PaintingWithWatercolors.com over the couple of weeks. During May I implemented some software which will allow me to run various surveys regarding watercolor painting. My current survey asks visitors about what types of paintings they most like to paint in watercolor. So far landscapes are ahead but I will provide a more comprehensive update in the next newsletter. My wife and I are taking a 4WD trip through the Kimberley region of North West Australian during June. Hopefully I will bring back some nice paintings and plenty of reference material! If you have any watercolor questions about my watercolor newsletter or would like to contact me please do so through my Contact form above. The earth watercolors are already a mix of the three primary colors, however each leans a little towards one primary or secondary color. For instance, Burnt Sienna has a strong orange leaning, Raw Umber has a slight greenish tinge, Raw Sienna is a yellowish brown with a slight greenish tinge, while Yellow Ochre is obviously a Yellow with a slight red leaning. 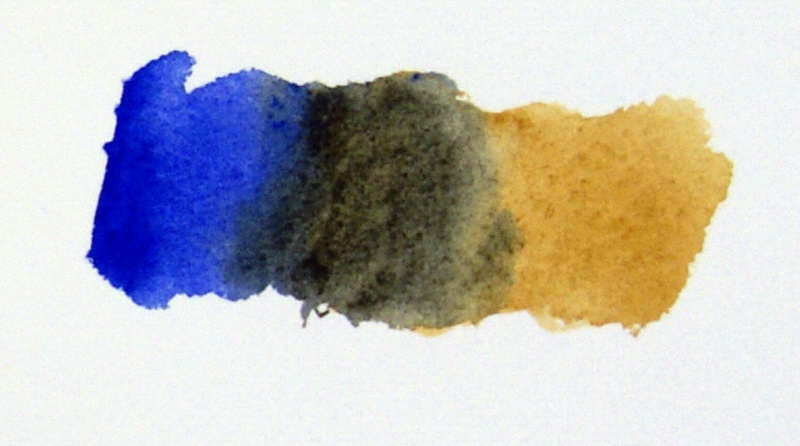 Looking at these earth watercolors this way explains why French Ultramarine (primarily a blue) when mixed with Burnt Sienna ( Orange = Red(R) plus Yellow(Y)) gives you a beautiful dark color, almost a black at times, depending on the relative amount of each pigment mixed and the quantity of water used. 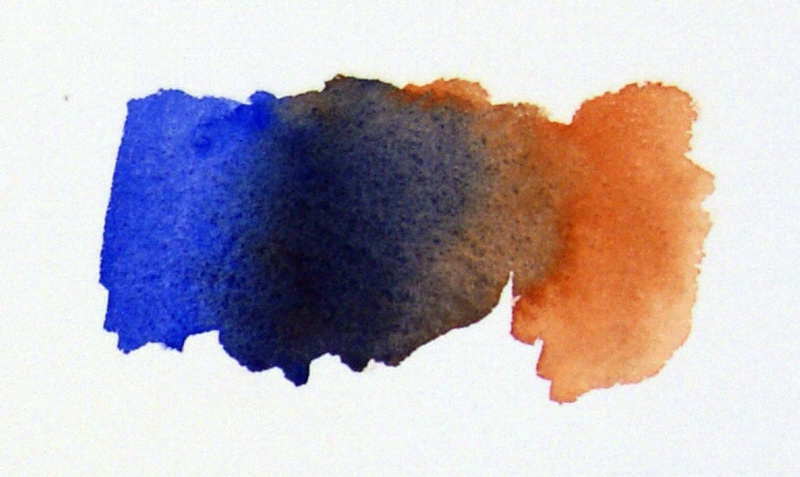 French Ultramarine + Burnt Sienna = (B + r) +(R + Y) = B+Y+R = Strong dark color. French Ultramarine + Raw Umber = (B + r) +(Y + b) = B+Y+r = dull green color. The earth colors are more complicated as they already have some of each of the three primaries in them. Effectively they are already greys (colors made when you mix three primaries together) which lean towards one or more of the primaries. The indications after the equals sign ( = ) refer to the colors the brown leans towards. Hopefully this information about earth pigments and their component colors will help you to become more confident with your own color mixtures. We can create a very simple formula from what was covered in the previous segment on color mixing, that will tell us whether we will end up with a dull (tertiary – three primary colors) or more pure color (secondary – two primary colors) from the mixture of two pigments. 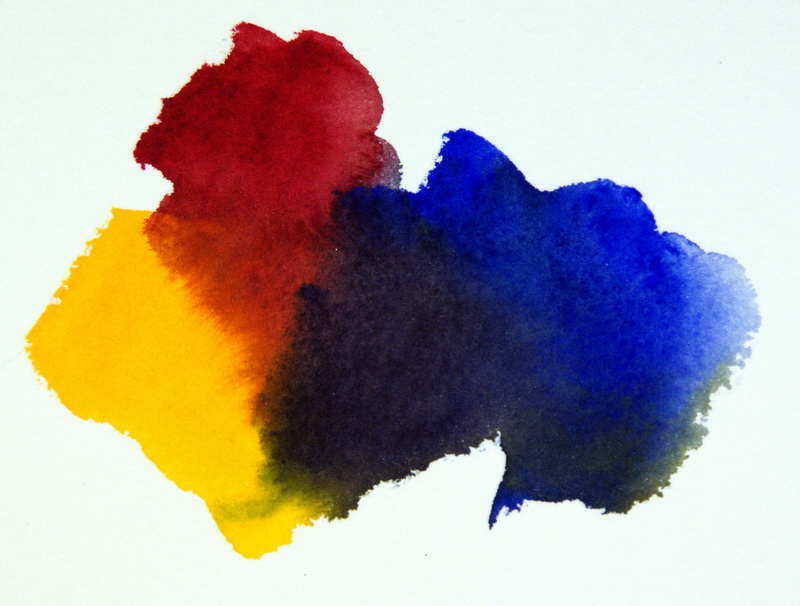 It is the addition of this tiny bit of yellow in the mixture (the third primary color) which results in a more subdued purple, than the French Ultramarine and Alizarin Crimson mix. When looking at color mixtures I am leaving out any effect due to the relative transparency or opacity of the particular pigment. Why is the color mixing formula important? There are a number of key reasons why this is import. Firstly, if you cannot predict just what color you will end up with when you mix two pigments together it will leave you a little uncertain and this will impact your work. The second reason comes from the knowledge that the further away an object appears from you in a landscape then the duller the colors look due to the effect of atmosphere between you and the object you are viewing. Hence, by using this knowledge of color mixing you can easily mix duller paint combinations to correctly place your objects in the various landscape planes e.g. distant, middle distance and foreground. Now obviously, one can learn which colors mixtures of your various pigments will produce by trial and error, but hopefully with this knowledge you will be able to take out the trial and error and much more quickly learn how to mix clean and pure or dull and grey colors at will. It also means then you have a tool to better judge whether the addition of a new pigment to your pallet will add to the range of colors you can currently mix. Time spent really looking at your pigments and analyzing just what their component colors are will save you a lot of confusion and frustration later on. It will also boost your confidence while painting and this will show through in your work. By the way, pigments with the same name but from different manufacturers do not necessarily have the same component colors. For this reason the examples in this article only relate to Winsor and Newton artists quality watercolor paints. I had a student trying to mix a particular dull dark green color for which I used Raw Umber as a component it is a yellowish brown pigment with a very slight greenish tinge, but the brand of Raw Umber my student was using was more of a red brown in color so no wonder her green mixes leaned further towards the red than mine. In the final section we will look at the earth colors and see how the watercolor mixing formula applies to them.